Magical Mystery Cure is a light magical crafting game with some visual novel elements. This game was made during Queerly Represent Me's Game Jam. 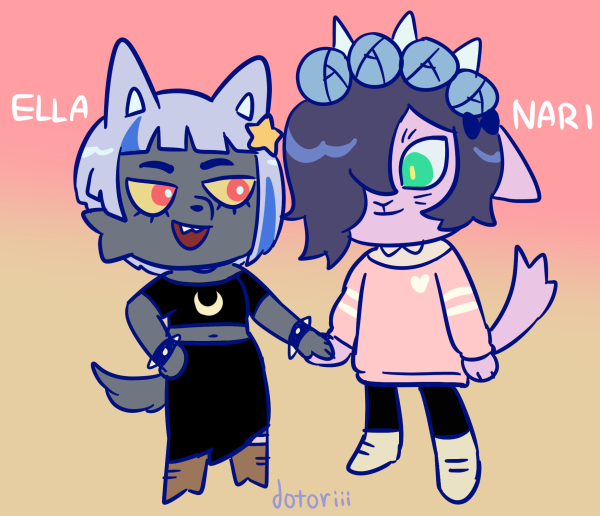 It's Ella's birthday today, and her sweet partner Nari has invited her over for a lunch date at their cottage before the big party. All is going well until Nari's ever-hungry cat, Squidbucket, accidentally knocks over a potion while he was trying to get to Ella's food. 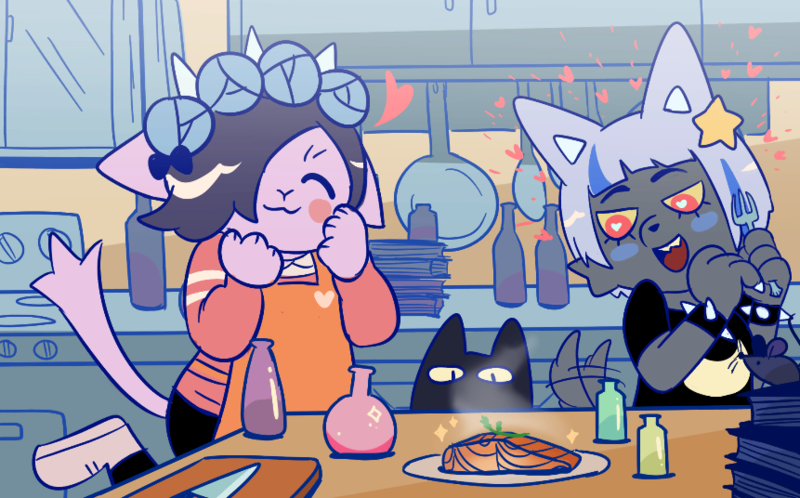 The contents of the potion seep into Ella's meal and before Nari can say or do something, Ella takes a bite of the now-enchanted food. When the smoke clears, Nari finds that something's wrong with their GF's face, well, all of it actually. Before Ella's birthday party starts Nari has to find the right combination of ingredients to get her face back to normal! Nari (genderfluid - 23 - she/they) - The player's character. A young witch-in-training who lives in a cluttered cottage. She's dating Ella. Ella (trans woman - 22 - she/her) - The unfortunate one whose face may never be the same. An oracle of the stars. She's dating Nari. Squidbucket the Cat (he/him) - Nari's small cat with a large appetite. Check out the concept art & assets here! I find the text at the beginning too hard to read. It is very small. I also find there is a bit too much "story" in the beginning before the actual game, I realize it only 4 minutes but I totally forgot I wasnt playing a visual novel when the actual game started up. Especially since there is a time limit it seems on how many potions you can make. I think the game has good potential. Tightening up the story in the beginning so its only 1-2 minutes would be better. A larger, easier to read font and remove the time limit or put an actual clock so you know your time limit, and I think it's be most ideal! The art is adorable, and I like the game play, mostly. It was be frustrating but thats part of the game and it's fun to get so close and OOPS! Although I did notice that when I was making potions, I was writing it down, and x+y+z=perfect eyes. When I was dinking around to get other parts and the eyes messed up I tried x+y+z and the eyes were still messed up. So I am wondering if its just a glitch, or if the potions are random or what. Either way, I think this is a good start to a game. For the antidote, I played the game a few times trying to get it right, and it seems the cures are only for specific things. So a cure will work fine for the toothy mouth, but if you have a different type of mouth, that cure won't work anymore. Hope that helps! That seems fine, however the game itself says to write down combinations, if the combs change depending on the actual attribute, it seems pointless to write things down. I still find it helpful to write things down because if you happen to get that specific nose, eye, or mouth again, you can use the same antidote and it works. And the antidote is the same in each playthrough. It's super cute! I love the designs and the art A Lot. The short conversations are wonderful as well. I gotta say I wasn't expecting that sudden cut during gameplay but it was honestly kinda funny!! Maybe if it isn't a secret (since I am now reading about limited time on the summary) you should have a move / time counter on screen?